1. Safety DeJon Gomes who sat out of practice on Monday after a collision in Friday’s night’s game at Oakland does not have a long-term injury. Uncertain if he will practice this afternoon. 3. Caldwell said he will rotate kickers Nate Freese and Giorgio Tavecchio in Friday’s preseason game with punter Sam Martin kicking off. Caldwell repeatedly said the competition between Freese and Tavecchio is close and will be a tough decision. 4. Raiola’s words of advice for Cleveland’s Johnny Manziel who gave the one-finger salute to the Redskins’ bench on Monday night. “Enjoy the FedEx,’’ Raiola said. FedEx will deliver the notification of a fine from the NFL. Raiola’s been there, with fines of $7,500 and $15,000 for gesturing to fans. Last season he made a donation to the University of Wisconsin band after words were exchanged.. Since it’s a first offense for Manziel, it’s expected to cost him about $11,000. 5. Matthew Stafford has worked hard in the offseason by all accounts. But his body is pretty much the same. 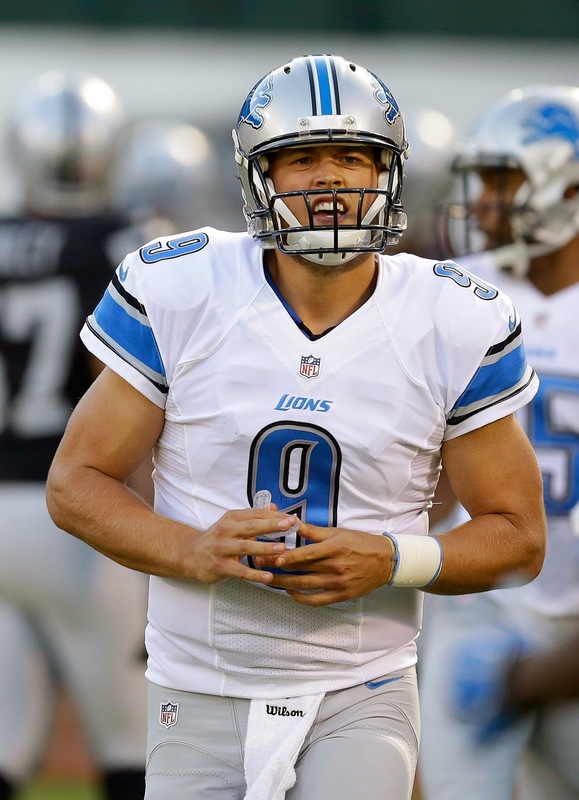 “I’m not any faster, I don’t think I’m any more jacked,’’ Stafford said.